The firm was awarded a Silver standing in the “Specialties” category for a calendar created for John Zubick Ltd.
London, On.-based Marketing Strategies & Solutions has again been recognized for excellence in graphic communications by the international Summit Creative Awards. 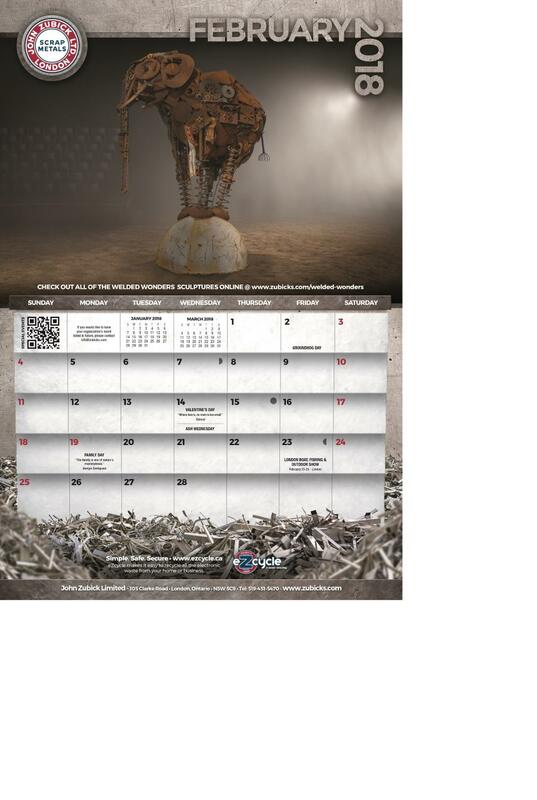 The firm was awarded a Silver standing in the “Specialties” category for a calendar created for John Zubick Limited, a London, Ontario recycling operation. The project is the most recent in a popular series that the agency has undertaken for Zubicks' over several years. The large format wall calendar features artistic interpretations of scrap metals and sculptures at Zubicks' recycling yard on Clarke Road in London, On., while still serving as a useful planning tool. The Summit competition, now in its 24th year, celebrates creative achievement by small and medium-sized advertising agencies and studios. The 2018 award program drew more than 5,000 entries from a record-setting 26 different countries. The Zubicks' calendar that Marketing Strategies & Solutions entered to the Summits last year was singled out for one of four coveted Judges Choice awards, a special designation for exceptional work, drawn from all categories. Established by Robert Adeland, Marketing Strategies & Solutions, now celebrating 21 years of operation in London, On., has found a successful niche in the marketing world as a specialist in integrated communication services for industrial manufacturers and other business-to-business clients. The firm is one of the select advertising agencies in North America to be admitted as members of the Association of Equipment Manufacturers (AEM). Major clients in Canada and the United States include John Zubick Limited, SENNEBOGEN LLC, Mack Manufacturing, Winkle Industries Inc., Camso, North America Traffic Inc., BEKAWORLD LP and Hitachi Construction Machinery Loaders America Inc. The agency also serves numerous manufacturers and business services local to London and region.